If you love the tantalizingly tangy flavors of blue cheese, add a twist to your homemade burger with Castello Burger Blue cheese slices. They go great with sweet and tangy pickled red onions, crisp lettuce and chili mayonnaise. Conveniently sliced to the perfect thickness, Castello Burger Blue cheese will melt evenly across your burger, adding bold flavor with sweet and salty undertones. 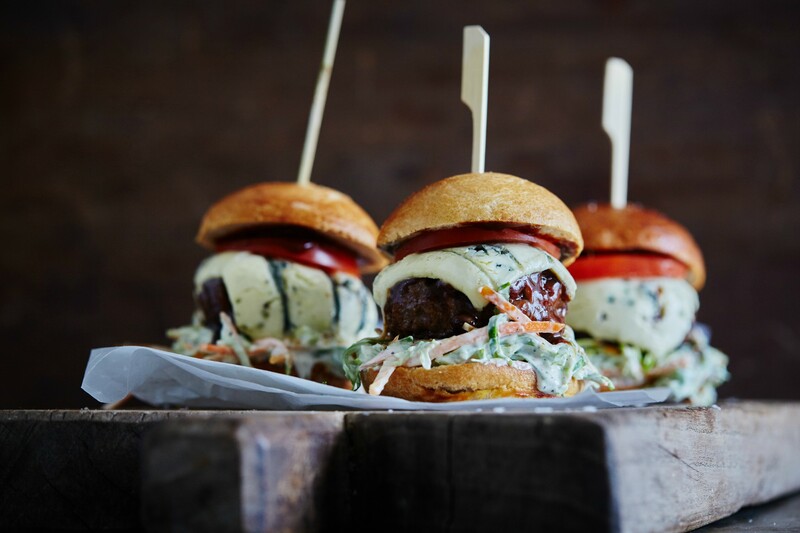 Here are a few tips for how to cook the burger - give it a go and create your own blue burger masterpiece! Always use fresh ground beef or meat of very high quality. Choose meat with 10% fat content as it makes for a more flavorful, juicy bite. The size of the burger can vary from person to person, but the thickness of approximately 1/4 inch is a good standard size. Season the meat with salt and pepper and form the meat into a ball with clean hands. Press the meat flat (you can place the meat in between two freezer bags). There should be no cracks in the edge of the meat. Heat the pan up well. Fry in a shallow mixture of oil and butter over high heat until you have a brown crust. Butter adds flavor and the oil ensures you can brown over high heat. Once a crust forms, fry on medium heat for about 6 minutes on each side. Let the burgers rest for 5 minutes before serving - you can add the blue cheese slices on top at this point so it melts slightly. Turn the burger several times while cooking to distribute the juice in the meat and give an even result. If you have multiple patties in the pan, don’t turn them all at once as it will cool down the pan and the burger will boil instead of fry. If you are making burgers for a lot of people, you can brown the patties for a few minutes in the pan in butter and oil and bake them in the oven for about 12 minutes at 350 degrees. It is much easier to control and does not require multiple pans. 6. Grill the burgers for maximum flavor! The burgers can also be grilled, either on the grill pan or outdoor grill. If you use the outdoor grill, patties should be shaped perfectly, so no cracks. Brush with oil and turn very cautiously (and as little as possible) with a wide spatula. Invite your friends and impress them with your own homemade gourmet burger. Below you'll find a selection of delicious cheeseburger recipes.